People often make the incorrect assumption that it was the svelte 916 sports model that saved Ducati – and that the racing skills of Carl Fogarty led thousands of 916-based machines to be sold. But, it was in fact the much more humble Monster range – and the M900 in particular – that can be said to have helped keep the troubled Bologna firm’s head above the choppy waters of the early 1990s. The Monster project itself started – like so many classics do – as a mere styling exercise. Late in 1992, designer Miguel Galluzzi was asked to pen something different and unique and he had just the machine in mind: his own. Yes, Ducati legend has it that Miguel was tooling around on his own, stripped-down 888, without a fairing around the streets of Bologna and it was this ‘look’ he wanted with the original M900 Monster of 1993. With this in mind, he penned a classic! Remember, up until then Ducati’s reputation (for what it was) was for building pricey, brilliant-handling and sometimes temperamental supersports bikes. 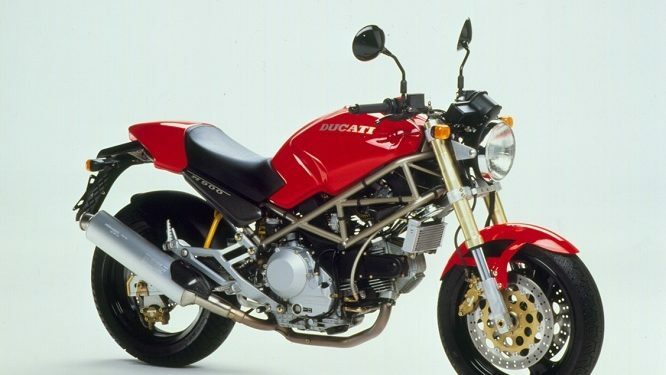 The Monster would elevate Ducati into the mainstream and – finally – people could make a buying decision between a Japanese and Italian machine without making excuses. The look was pared-back, showing that trademark Trellis lattice frame (from the 888, no less, along with the sporty steering geometry) and an air-cooled motor, taken from the 900SS, although it was geared-down for more grunt. The rear seat was sparse and generally covered by a seat cowling. The back end was stunted, way before we saw the opposition follow suit in the mid-2000s. The seating position for the rider a little cramped, thanks to high-ish pegs and the steering lock almost as non-existent as the rev-counter. This Spartan approach to an urban road bike was a big hit: Barry Sheene even had one and reckoned it was an iconic machine. 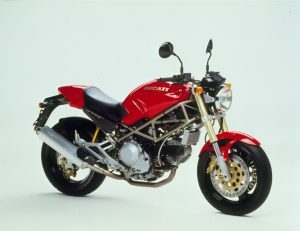 The first model to be released was the M900 Monster (80bhp) followed later by the M600 (54bhp) released in 1994 and the 64bhp M750 released in 1996 (there was also a 400cc tiddler, powered by the lack-lustre 400SS Junior motor for the Italian and Japanese markets.) The smaller-capacity machines originally would have only a single disc, but this would change on some models later on. Apart from the visual and dynamic appeal, at last there was an easy-route into Ducati ownership. Also, a wide-range of accessories soon appeared so you could make your Monster unique. Pretty soon ‘S’ models with bikini fairings also began to appear and the Monster family proliferated – later into liquid-cooled S4 variants, but they are for a later article. If there was a downside, it was build-quality – especially on the pre-1997 (Texas Pacific Group takeover) models. Like any Duke, you have to maintain it properly (belts and valve adjustment) and give it TLC otherwise the motor goes pop and paint can drop off both the motor and the wheels in just weeks. Electrical issues can also rear their ugly heads if not sorted ASAP. Price and model-wise the earliest would be the most collectible, but the later ones are more ‘sorted.’ Go for one with a decent service history and perhaps good, Ducati modifications such as Termignoni exhausts. Within the last decade you could find a good, clean M900 for £1500 – but no longer! Today, you’d be hard-pressed to find a tatty, but solid 600 for that amount. Prices now rise to £4500 for an original 1994 M900 in very good order. Thankfully, there are lots of various capacity machines that are priced in between. Ciao bella! FOR: Look great, go well and not bad value! AGAINST: Poor finish on early models. Major changes Moved to grey finish cam-covers in 1994 gold frame/wheels, Showa forks in 1997, new ‘DUCATI’ logo in 1998. VERDICT: A classic that is useful and fun to ride.